ASP blades are produced from the finest stainless steel. They are forged to shape, then hand ground, mirror polished and precisely honed to razor edge. Each knife fits conveniently in the pocket or on a keyring. 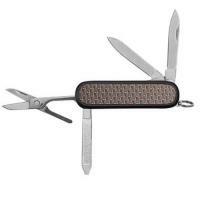 The Select Knife comes equipped with two Pen Blades, one being a Liner Loc Pen Blade, a File/Scale, Screwdriver, Scissors that incorporates a frame mounted return spring and a Split Ring with Detachable which allows attachment to a keychain.